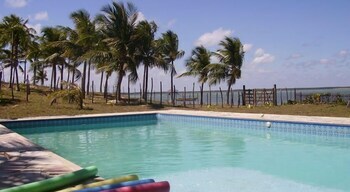 With a stay at Pousada O Forte in Mangue Seco, you'll be just steps from Estado da Bahia Point and Mangue Seco Church. Featured amenities include a 24-hour front desk, multilingual staff, and luggage storage. A train station pick-up service is provided at no charge, and free self parking is available onsite. With a stay at this apartment in Rio de Janeiro (Flamengo), you'll be within a 15-minute drive of Catedral de Sao Sebastiao do Rio de Janeiro and National Library. With a stay at Pousada Alquimia in Jericoacoara, you'll be a 4-minute walk from Central Square and 5 minutes by foot from Jericoacoara Beach. Located in Sao Sebastiao, Kyrios Pousada is within a 15-minute walk of Maresias Beach and Maresias Square. Free self parking is available onsite. With a stay at Pousada Recanto Itaúnas in Conceicao da Barra, you'll be 15.1 mi (24.4 km) from Conceicao da Barra Beach and 15.8 mi (25.4 km) from Gesuel Beach. Free self parking is available onsite.